I no longer have to think about the answer to the question “who’s the world’s greatest living director?” Eric Rohmer now has the title unquestionably all to himself.¹ Ingmar Bergman died Monday. Appraisals are already pouring in (including this pre-death one by, of all people, Joe Queenan) and I learned of this invaluable site. More than any other director, Ingmar Bergman was the man who taught me that movies were, or at least could be, more than “just movies” or “mere entertainment.” That films could even be profound quasi-religious experiences. He was also one of the few artists who seemed to have a direct line to my soul — albeit in reverse overall, but while fitting near perfectly upon mine in certain details. There are, needless to say, a vast number of films that point to important truths about human existence without necessarily tapping into something that is quintessentially Christian or Catholic. It would obviously be a crude-minded injustice to reduce Bergman to an unintentional cautionary tale against atheism. Among other reasons, his films are far more complicated than that — partly because hell-on-earth cannot literally exist and partly because even though Bergman became an atheist, he was serious enough that he could never live happily with that thought. 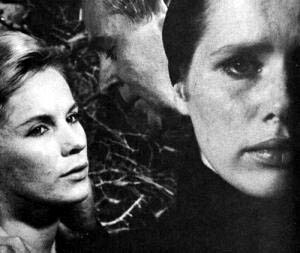 The first two Bergman movies I recall seeing were the Medieval morality tales THE SEVENTH SEAL and THE VIRGIN SPRING, both of which I liked a lot. What was immediately obvious was that these movies were different — worth simply looking at and to think about. I also saw them, more or less, at the time I was recovering from adolescent atheism and reverting back to the Catholicism of my boyhood. I already knew of Bergman’s reputation for dark, brooding religiously-based Angst, but these movies spoke to my soul in a direct way. In the early 60s, Pauline Kael mockingly described Bergman as appealing to “schoolboys who’ve just heard for the first time that God is dead.” But remember that “God is dead” was said by a man who saw that this was as terrifying as it was liberating. And that was exactly the appeal Bergman had. But when at the end of THE VIRGIN SPRING, a character makes a penitential vow, it somehow didn’t matter how relentlessly grim the rest of the movie was. The famous dance on the hillside at the end of THE SEVENTH SEAL works similarly — the last thing we see is the family in the background of the above image happily driving away to a few discreetly lyrical notes. Bergman doesn’t take God’s silence or even God’s cruelty as an excuse for smug posturing — he looks on the possibility with dread (Angst, even). Never forget that Heidegger, the man who gave us the current usage of Angst, began adulthood as an Catholic seminarian and that Bergman and existentialism were strongly influenced by Kierkegaard, to whom I was introduced by a fundamentalist Calvinist theology student. 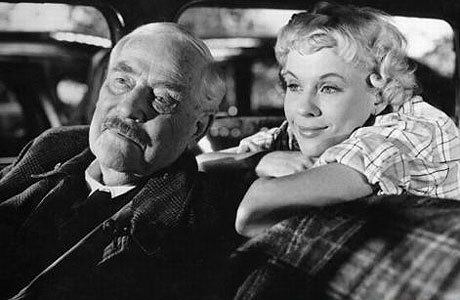 Then, after a mystifying experience with PERSONA that cause me to dismiss the film for years as a mere exercise in cryptography, came WILD STRAWBERRIES. And the face of Victor Sjostrom. Very little, in conventional terms, actually happens during the film’s picaresque except the accumulation of flashbacks and events during the old professor’s car ride to receive an honorary degree. Some of these episodes are riveting in themselves as stand-alone sequences (the bickering married couple; watching the family gathering from his boyhood; the opening dream of clocks without hands, etc.). But Bergman famously said that the most interesting thing to photograph is the human face, and the whole drama in this film is in Sjostrom’s face. What matters is how Sjostrom reacts throughout to such moments as the two youths who debate God’s existence or the resemblance between the girl he picks up and his heartbreak of a lifetime. WILD STRAWBERRIES was an surrealist/Expressionist visual stunner to be sure (the harsh lighting and silence in the opening dream sequence is a vision of hell without a single flame). But what has stayed with me for almost 20 years is that it was the first time I recall watching a film’s drama primarily through a psychological prism, through an actor’s face, through reactions and refractions, rather than action per se. This disposition, toward psychology and “the pilgrim’s progress of a soul,” is one I retain³ and WILD STRAWBERRIES was an early case of that sea change in my viewing habits. Like SEAL and VIRGIN, STRAWBERRIES ends with a moment of grace as Sjostrom lies back on his pillow to a few notes of music, like the Softened Scrooge of Sweden. This pattern, of Hell drenched in a few cathartic final moments, continued throughout Bergman’s career. His famed Swedish TV mini-series SCENES FROM A MARRIAGE (I’ve only seen the 170-minute theatrical cut; reputedly the five-hour version links the disintegration of the marriage to an abortion) is in no serious sense a “happy movie.” But its principal subject is love, and, in a perversely Existential way, SCENES FROM A MARRIAGE is actually a moving and romantic film about the subject because it shows how love can remain in the end, even when it is dead (“Love is Dead”?). 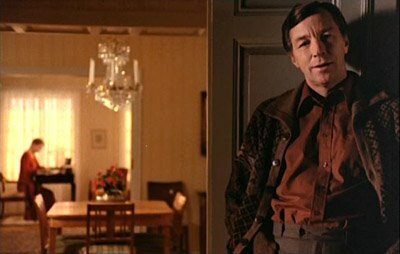 There’s nasty recriminations, abandonment, second marriages and even a hard-to-watch scene in which Erland Josephson beats Liv Ullmann and then screams at himself in a pitiless rage. There’s a rawness to the emotions in Bergman’s color movies that his black-and-white movies tended to politely and coolly intellectualize in that Scandinavian chamber-play way. I’m thinking first of THROUGH A GLASS DARKLY and even WILD STRAWBERRIES to some extent. 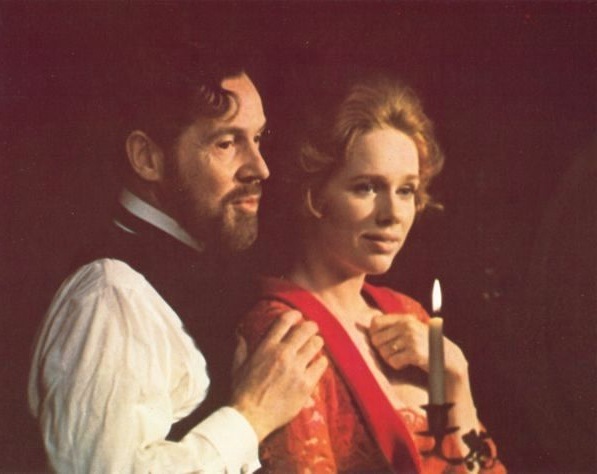 And not just of SCENES among the color movies, but also Ullmann’s portrayals in FACE TO FACE and AUTUMN SONATA. We get a similar catharsis in another of those Bergman color movies. FACE TO FACE, where Jenny sees her grandparents with one another and learns what the doctor meant in the atheist prayer about becoming real and so rejoins the “army of crippled wretches.” And the last shots of the epiphany in this very dark and mercilessly oversaturated movie (a common Bergman trait in color) is in bright sunlight. By the mid-70s Bergman had pinned all his faith on human relationships, often as symbolized by the touch of another. The key to this is that AUTUMN SONATA begins basically identifying with Eva and her preparations for Charlotte’s visit. But in the course of two virtuoso scenes — one at a piano, the other a late-night quarrel — identification shifts to at least neutrality. Here’s the earlier and first-named scene, unsubtitled, but it hardly matters. There’s a similar long take focusing on Eva’s curdling face while Charlotte demonstrates all of Eva’s piano-playing faults, and your reaction then is “poor Eva, Charlotte is a pig.” Now it’s “poor Charlotte, Eva is a pig.” Each is in her own way a pig, but not a mere pig — that is, the pigdom of each feeds off the pigdom of the other in particular unique ways. And so the open ending is absolute genius and hard-eyedly realistic. They DON’T reconcile because, as Ebert notes, Bergman realizes that the past can’t be set aside because we ARE our pasts, that Eva is as deluded in the end as she is in the beginning. The last lines of the letter are a letter Eva writes to Charlotte (paraphrasing from memory) — “I will never let you out of my life again. Even if it’s all for naught and it’s too late. It must not be too late.” The wish is father to the thought; Eva wants it all to happen again. I mean, if you were Charlotte, would you even look at that letter when it came to you (and it’s obviously from Eva) given what happened in the course of film time? The husband actually gets the movie’s last shot and the look on his face as he puts the note back into the envelope tells us everything. He is the wisest character in the film — awake to both Charlotte’s and Eva’s flaws. And yet … since the surface tone of the last scene is not hopeless and it doesn’t take an imbecile to think that the quarrel may have been cathartic — you can see this same movie playing itself out again and again — hopeful beginning, tension building, demons reign. Eventually, I did come around to considering PERSONA a masterpiece, and I did so when I stopped trying to “decode” it, particularly the famous beginning and the rhyming middle sequence when the film “breaks.” I eventually came to realize that the film must, by design, disintegrate after this because Eden has been destroyed by sin’s introduction. The idyllic world of the film’s middle section, the two women set apart, and the start of the film, with nurse and patient clearly delineated — they cannot contain the pain and the hatred that the shard of glass has introduced into that world. And done so directly, as opposed to through representation as with Elizabeth facilely watching the TV, say. The glass also represents the disintegration of identification and role (“who’s the hunter, who’s the game,” in Patty Smyth’s opinion), and so everything that happens after that may or may not be a dream or a fantasy. But to try to definitively answer what’s what misses the point — as opposed to Fellini’s 8 1/2 which, as I say in the footnotes, is rigorously tied to one subjectivity but which is hence completely transparent. PERSONA, at least by the end, is not and cannot be. In other words, I had been trying to impose order where disorder must reign. Torsten Manns: That’s when Alma begins to become schizophrenic; her speech disintegrates. She notices that the other woman is projecting herself into her. With her. Ingmar Bergman: Yes, words cease to exist for her. TM: But that’s part of the schizophrenic syndrome. IB: As I see it, Alma’s aggressions in this dream situation take on such enormous proportions, she finds she can no longer use words. She becomes violently disturbed; loses her ability to express herself. She’s like a machine that has gone to pieces but just goes on turning madly, and her words, without any ordered context, just come tumbling out. Bibi found it frighteningly hard to memorize those word-series. To learn a totally meaningless series of words by heart is said to be about the hardest thing you can do. Nykvist was able to get the kind of images that … made Bergman Bergman — a bold chiaroscuro in the overcast pearl-gray Swedish light in the black-and-white movies; a mercilessly bright, decadent and pastel-free hues in the color ones. Two movies in that latter category — CRIES AND WHISPERS and FANNY AND ALEXANDER — won Nykvist his two Oscars. For an example, look at this shot from AUTUMN SONATA. ** As I said about the Thai director “Joe” having a distinctive look to his films based on the lighting near the Equator, the Swede Nykvist seemed to work best when working with soft, diffused light in nature and a harsh interior contrast. 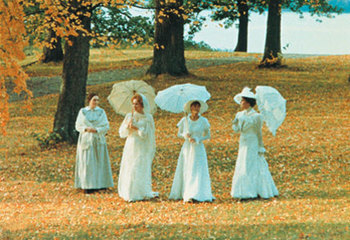 Every time I see CRIES AND WHISPERS (one of my 10 all-time faves), I get a physical chill down my spine and goose flesh all over when we get the outdoor scene that ends the movie — so different in feel, look, breath and ultimately hope from everything that went before it. Notice how in both cases, in one image the color is dazzlingly saturated, almost to the point of ugliness, while in the other it’s far more muted, to the point of poverty in the FANNY AND ALEXANDER shot. Without seeing the movies in question, it might look like an empty trick, but Bergman/Nykvist played with color and light for dramatic and even theological purposes. 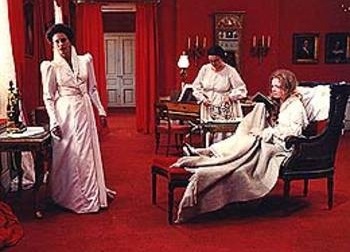 In the pair of images from CRIES AND WHISPERS, for example, one is a human-lit interior, of both a set and the human soul, while the other is an exterior scene with natural light shining down to grace us. Despite all these great achievements (and I haven’t gotten to the greatest yet), Bergman’s critical esteem has been slipping in recent decades, to the point where he’s basically been supplanted in the cinephile pantheon category of Dour, Dark, Boring European Killjoy by Robert Bresson, Andrei Tarkovsky and Carl-Theodor Dreyer. There’s some history here. When the cinephilia bug bit me in the late-80s, all of Bergman’s best and best-known films were already on good-quality home video and relatively well-distributed at video stores. By contrast, Bresson, Yasujiro Ozu and Dreyer — to name just a few “difficult” or “arty” auteurs — were either mere rumors or available only in one or two films only in quickie or pirated or public-domain forms. But not Bergman. Along with the considerably less-“arty” Federico Fellini and Akira Kurosawa, his movies were easy finds at that time. 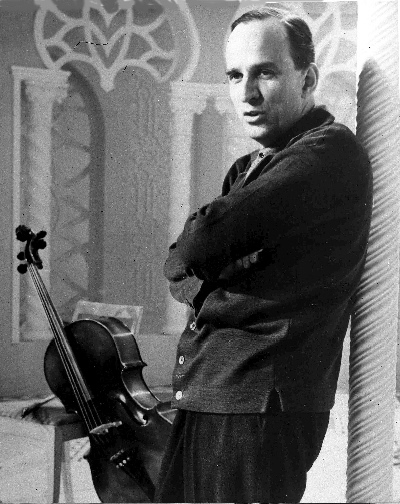 And Bergman was himself a superstar, known to people who didn’t watch his movies (and would have hated them if they had). For about a quarter-century from 1955 to 1980, give or take, Bergman was the most recognizable “brand-name” art-house film-maker, and the knowledge of him lingers to this day. More than one person at work earlier today said he knew who Bergman was without having seen any of his movies. 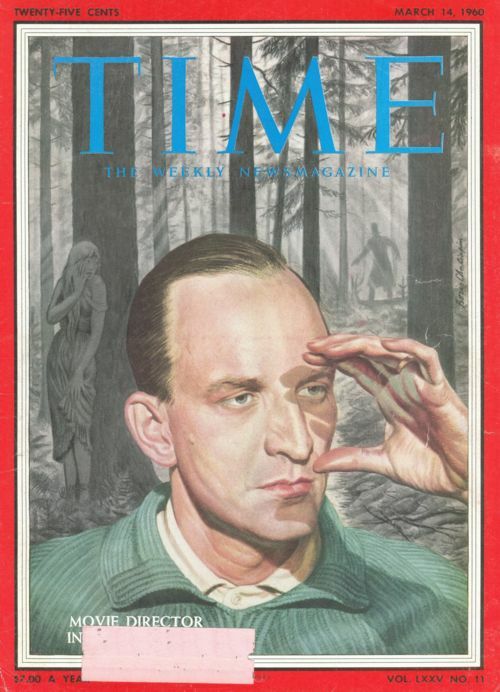 He made the cover of Time, back in 1960 (can you imagine Michael Haneke or Wong Kar-wai there today). Van Halen alluded to his works. SCTV parodied him. And the famous image of Death in THE SEVENTH SEAL was grist for comics from Woody Allen’s LOVE AND DEATH to BILL AND TED’S BOGUS JOURNEY. I even recall a MAD Magazine parody of a Garfield strip as done by Bergman (“We are insignificant specks in the scheme of eternity. We should die,” Jon says to Garfield. Then Odie enters the strip.) There’s more here too. One night in that period, after coming back from the video superstore (a new concept at the time) with several tapes, a couple for the whole family to see, and Bergman’s THE MAGICIAN to watch by myself. My mother asked (you have to imagine this conversation in Glaswegian “patter”): “what’s that other one?” I said, “oh it’s a Swedish film.” She said: “are you watching manky⁴ Swedish movies?” My father rolled his eyes and said “I don’t think it’s THAT kind of Swedish movie. Probably the kind of Swedish movie where they winge about death.” On another occasion, a Swedish co-worker at the newspaper in Augusta, Ga., asked me, when she discovered I was a film buff, what I thought about Bergman. I started to launch into a panegyric before realizing that Karin was not herself a fan. “We don’t like him. He’s given all us Swedes the reputation for being gloomy,” she said. 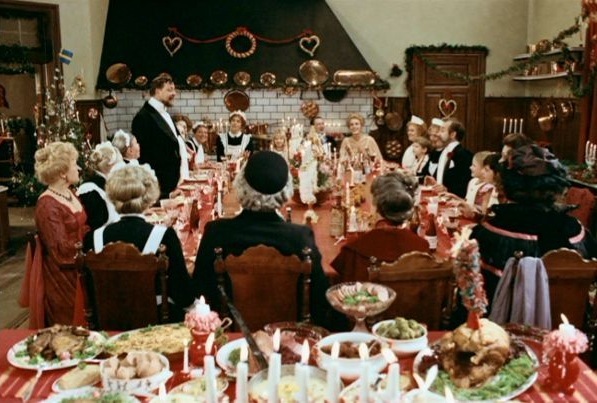 But that very topic, unfortunately, is the subject of Ingmar Bergman’s greatest achievement — CRIES AND WHISPERS, one of my Ten Official All-Time Favorite Films. It’s a stylized period piece about the ultimate existential fact: Death. Or more so, Dying. If you haven’t seen it, do so. It’s not an easy film to sit through: in fact, CRIES AND WHISPERS may be the most emotionally grueling movie I’ve ever seen. But seeing it was an epiphany like few I’ve ever had, inside or outside the movie theater. Counterintuitive though it may seem, it’s the ideal depressing movie for times of depression. Agnes (Harriet Anderson) is dying of cancer. 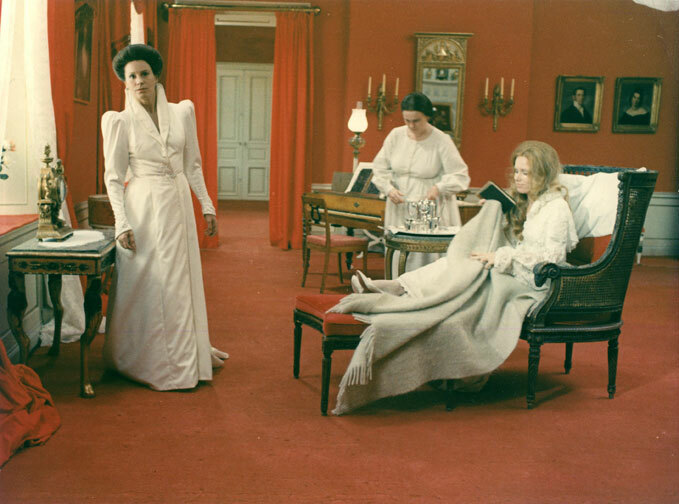 She and the servant Anna (Kari Sylvan) are joined at the family mansion by her sisters Karin (Ingrid Thulin) and Maria (Ullmann), for the last days. There are some flashbacks that reveal that the sisters have grown apart. The behavior of the two visiting sisters to their husbands is psychologically of a piece with what we see among each other in the present, and each has a husband they deserve: a prig and a cuckold, respectively. The only real love in the movie is between Anna and Agnes, exemplified in this famous Pieta shot (which has caused the crude to read lesbianism into the film). Only Anna prays in the whole movie, not even the film’s one pastor, who prays over Agnes’s body in the conditional tense. Scene after scene plays with perfect, dream-like control, characters seeming to float slowly on the floor, talking in clipped, polished lines and remembering their pasts largely in enormous closeups. One especially great scene consists of Ullmann and Erland Josephson (the first picture above) looking into a mirror during a crude seduction attempt by Ullmann and, in one unbroken take, reading one another’s faces and seeing both the flaws in the other and in themselves as refracted through the other (as I said, the characters in CRIES get whom they deserve). I can’t watch this scene without tears welling up and physical chills coursing throughout my spine. The closing title-card words mean “and the cries and whispers cease.” Bergman has (kinda, after his fashion) come to terms with death by his character being “profoundly grateful” for the grace of life’s holy moments even in the midst of everything else. It’s a hope, but one that doesn’t come cheap or easily. In the Criterion DVD of WILD STRAWBERRIES, one of the extras is a Swedish TV interview in which Bergman says he has come to grips with death being the absolute end. For him. But when he talks about his recently dead final wife, he refuses to believe that she is forever gone. Harsh judgment and existential authenticity is OK for himself, Bergman says, but not for others. But now, on this day, Bergman is one of those “others.” Who thus will never leave the rest of us. I doubt Bergman left the world on terms of friendship with God. Which makes all our prayers more needed than ever. ¹Among those film-makers for whom it’s reasonable to surmise that we have their whole career or near-enough-that. ² Yes, I know that sounds horribly pretentious, even for me. But that really is how intimately I have thought to know at least Bergman-the-artist and my reaction to him over the decades. ³ The four films on the very top of my Official All-Time Favorite List — A CLOCKWORK ORANGE, TIME OUT, REAR WINDOW, and 8 1/2 — can all fairly be called that, in spite of the four films having virtually nothing else in common. ⁵ My readership is extremely unrepresentative on the point, but I’m still confident at least a sizeable minority don’t get that allusion. ⁶ The two persons who’ve expressed the most contempt for Bergman in my presence and drawn my ire therein are both not simply atheists but anti-theists.